I might do RPGaDay again this year. I've done it in previous years, often with modifications to the questions. I guess I've got a day or so to think about it. The last session of the day was the first session where +Leah Wenman and I took part in separate games. During the first session I ran, while she played...during the second session, we both played. Session 3 saw me running "The Law", while she played a freeform dinner party game based on Jane Austen novels, appropriately called "Pride and Prejudice". The last debrief post started going longer than I expected, so I've decided to break the debrief into three parts for the three sessions of the day. 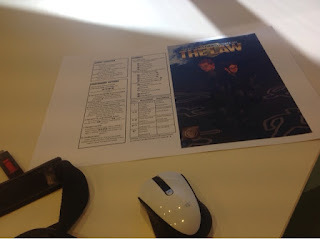 Between Sessions 1 and 2 was lunch, looking at the stalls set up by the local game store "Afternoonified" and a few others who came in for the con...and generally stressing out because I thought I'd left almost everything for my evening session of "The Law" at home. Thankfully, that last bit turned out to be a false alarm. But stressing about that, filled yhe rest of the hour-and-a-half before session 2 began. Session Two: Honey, I shrunk the Heroes! 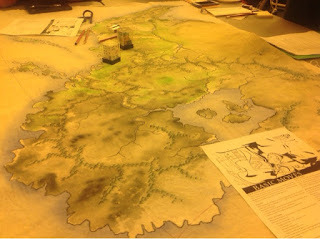 This is the first time I've played +Sage LaTorra and +Adam Koebel's Dungeon World, and the first time I've played rather than GM'd anything for a long time. I played with my wife, in a game run by +Saul Alexander. Session One: The Ballad of Jericho Julip. This was a session GM'd by me. Running a twisted variant of Paul Tevis's "A Penny for my Thoughts". I actually wasn't sure about the best way to handle this session, I had a vague idea in mind, but couldn't work out the best way to address it. I guess tomorrow is the big day. The game is ready to go, even if the props aren't completely up to a standard I'm happy with. The books have come up pretty well, and hopefully they might generate a few orders for the first proper print run. I might even sell one of the three prototypes I've generated. 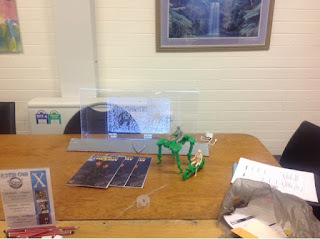 The thing that's got me bothered is the scemario map that I started working on a few months ago, but never got around to completing... and now Murphy's law has kicked in, and the 3D printer isn't working for me to make a stand. So, I might end up making a stand from cardboard. Since I'll be busy all day tomorrow, expect a report on the convention outcome in a couple of days. After working on the Ettin Con map fairly solidly for a week or more, it's nice to get back to my own project. I've had feedback, I've made changes... and now I've generated a few proof copies of the game. Which mght hopefully sell on Saturday at EttinCon, so that I can pay to put some petrol in my car. I'm pretty happy with the way these have printed, now it's just a case of using the guillotine to get them to the right size, and using the oversized stapler to assemble them (probably not in that order). I've tried to get more images, and even a couple more videos of the work procss, but my iPad hasn't been charging well, and there have been some glitches, so hopefully these images will suffice. My aim in colouring is to get cooler colours mixed with blues and more whites toward the south pole of the map, and warmer colours with more yellows toward the equatorial regions. There's lots of splotches and blending and varying techniques to give a range of terrain impressions. 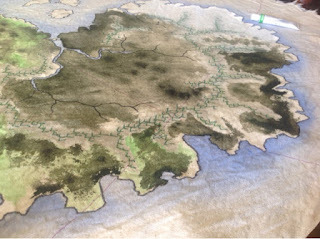 Darker areas indicating forests and jungles, lighter areas indicating grasslands and plains. One of the last steps is giving some more definition to the mountain ranges which have started to get a bit lost among the other colours that have now been added. Then the desert to the North East, and the icy waste at the south of the map. I'm not sure how it will look dry, so I just need to wait until tomorrow before I do some more. 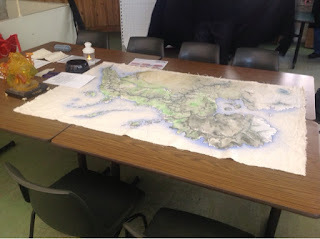 Today was the start of painting the mega-map. The whole thing takes up the full table in the art studio, even when it's been extended to maximum size. Before doing anything else, I need to add the latitude and longitude lines, but I certainly don't have any compass large enough to draw the arcs. So, it's time to measure things out and pull out the string. 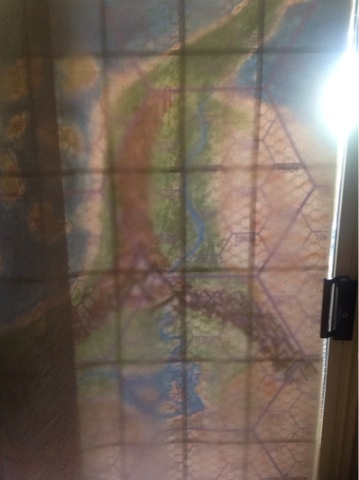 I've decided that I'm going to use a watercolour technique for the map. If I used heavy acrylics, or even put a coating of primer on it, it would become more difficult to sew things onto the canvas...which is one of the long term goals of the project. Using watercolour will function more as a stain on the canvas, so it might take a couple of coats to get a good rich colour happening...but we'll see how it goes. First I'll tape some plastic sheeting down on the table, this will make sure the watercolour doesn't sink through the canvas and into the wooden table. With the sketch and the canvas taped up to the window, I can trace the basic shape and maintain the generalities of the form. The specific details of the map sketch certainly don't match the intended scale, so thankfully I've got some leeway here. The first thing I'll do is break up the coastline a bit. 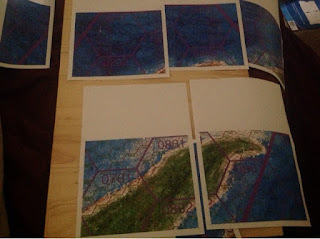 Here and there I add islands, and provide hints toward river deltas opening out onto the sea. The mountain ranges provide hints of where streams start, and the jagged coastlines provide ideas for where the riverways end. 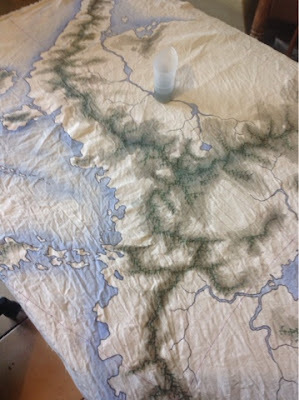 I've also been given a few rivers to work with, so it's now a case of using a rudimentary understanding of geography to piece these components together. I'm going to use a system where rivers are noted in two distinct types on the map. Wide waterways capable of being navigated by barges and ship-borne traders will be indicated with a double thickness, while smaller rivers and streams will be marked with a single thickness line. This map is pretty loose, it's for a blank slate world that will be defined as we go. But it's nice to have some hooks for players to latch onto, and for GMs to base adventures around. I've been given a rough framework (as indicated in the last post), but pretty free reign with specifics. 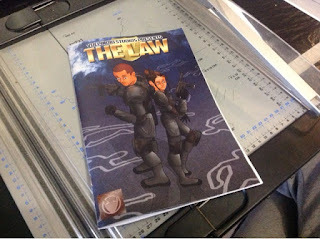 Or, more accurately, here are the pages on which the rough sketch has been printed, scaled up to be more impressive. ...gradually building the complete map. I've discussed fractal hexes before, in my geomorph series a few years ago. So it's nice to see a map given to me where this system is in place. Four of the smallest hexes across make one of the mid hexes, four of the mid hexes across make one of the large hexes, four of the large hexes make one of the largest hexes.